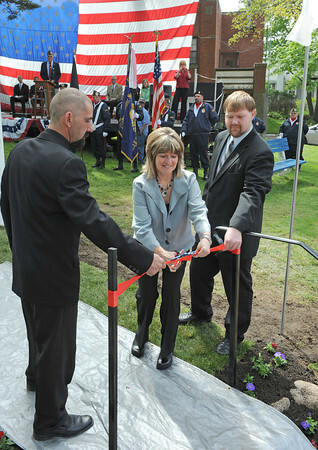 Magnolia: Mike Ramos and Rick Peek help Betty Cannon cuts the ribbon at the unveiling ceremony in Knowlton Park in Magnolia. honoring all service branches, Saturday morning. Fran Hines was to do the honor, but fell ill. Desi Smith/Gloucester Daily Times.